These burritos are completely bespoke as you can add any selection of filling ingredients you like, such as leftover roast chicken, ham, cured meats, black beans, olives, smoked salmon, sour cream, fresh or roasted peppers, chives, coriander and cheese. You really can suit yourself and have a different combination every time. Just keep the base of the egg and tortilla the same. Scoop the flesh from the avocado into a small bowl. Add the lime juice and a little salt and pepper and mash until smooth. Fold the wraps into quarters and pop them into a toaster for a couple of minutes to warm through but not toast crisp. They need to be able to open out again. Alternatively, warm them in an oven or microwave. Heat 1 teaspoon of the oil in a 24cm frying pan (or a pan that's not wider than your tortilla) on a low heat. Beat one egg in a small bowl with a little salt and pepper and add to the pan, swirling it until it covers the base of the pan like a crêpe. Immediately sprinkle half of the spring onions and half the tomatoes over. Cook for 1 minute, until the base is set. Flip the omelette over and cook for 30 seconds on the other side. Remove from the pan and repeat with the second egg. 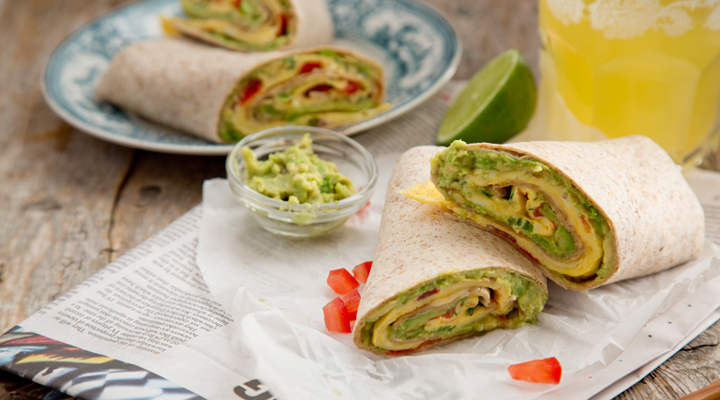 Open the warmed wraps out and spread the avocado mash evenly over each one. Lay an omelette on top and finely grate the cheese over. Roll each one up like a Swiss roll to enclose the filling. Cut them in half on the diagonal and serve. Tip: These aren't just for breakfast! They make great lunchbox fillers too. Try a different flavour combo for each day of the week (see the intro). If you're keeping an eye on your fat intake, you could leave out the avocado. You cannot advise to leave out the advocado as this is healthy fat!